I love all things cheesy. To me, anything with warm cheese equals comfort food. So, I “healthify” cheesy classics or develop new faves whenever I can. I just found this flatbread at the Walmart Neighborhood Market, and it’s now a permanent addition to my grocery list. I came up with this dish while heating soup for my BF, whose stomach has been bothering him. Prep-to-table took no time at all, so we were able to eat together. This wrap satisfies my craving for ooey gooey cheesy goodness and fills me up with lots of tummy-taming fiber. Heat veggies in microwave for 4 1/2 minutes, following package instructions, and empty into dish. 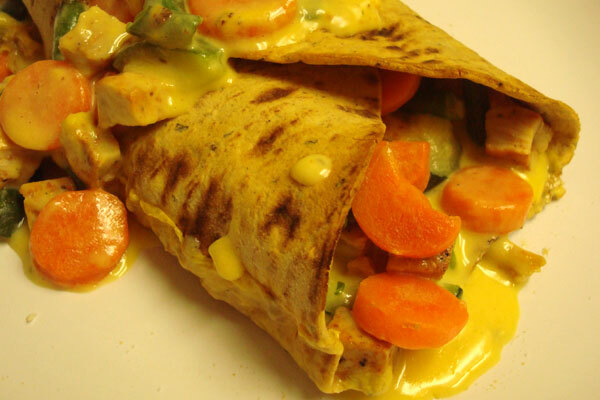 Break cheese slices into pieces, and mix diced chicken and cheese with veggies, stirring to blend. Scoop mixture into the middle of flatbread. Fold sides of flatbread over to cover mixture. This makes a very full wrap. Don’t worry if some of the filling falls out. Just scoop it up and ladle it over the top! Entry filed under: clean eating, food review, recipes. Tags: healthy fast food, quick dinner meals.